CENTRAL AIR!! Hardwood floors. Updated Kitchen and bathroom. All new wiring and CB elec. Vinyl replacement windows. LOW taxes! Nice southside area of homes. Covered front porch and private back yard with wood fencing. Shed for storage too! Enjoy the back view which is nothing but the woods. Deadend street with parking. Benjamin Franklin Elementary School Pre-School, Elementary School / Public 1 0.72 mi. East Middle School Middle School / Public 2 1.85 mi. St John The Evangelist School * Pre-School, Elementary School / Private N/A 0.28 mi. Children's Unit-Treatment & Eval * Elementary School, Middle School, High School / Private N/A 0.57 mi. 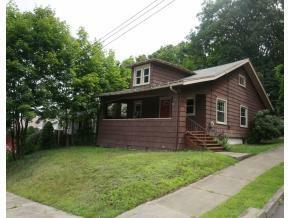 5 Evelyn Place, Binghamton, NY 13903 is a 2 bedroom, 1 bath single family home was sold for $68,900.